Like the moon orbits the earth it was inevitable that the Washington Redskins would sack kicker Shaun Suisham. 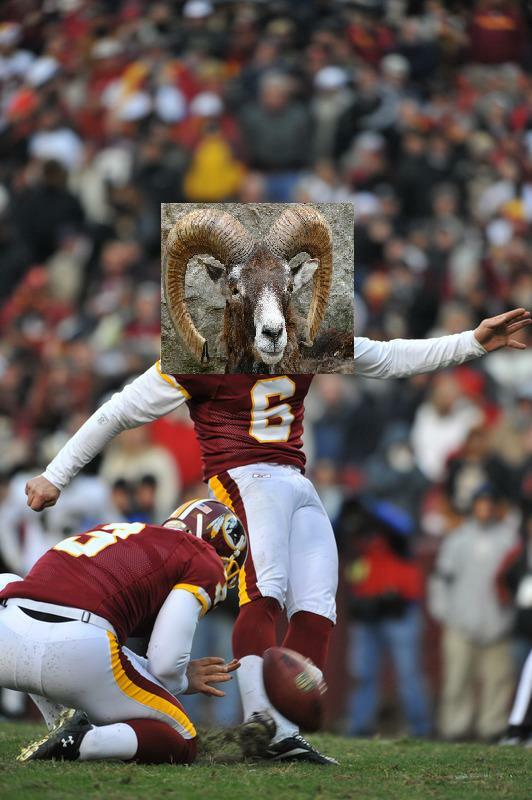 The question remains – is Suisham the Redskins goat after missing that short field goal that would have given his team a 10 point lead against the 11-0 New Orleans Saints? Or is he the scapegoat for an offense that should have punched in a touchdown for a 37-23 lead with under a minute to go against Drew Brees pinball wizards. I’ll go for GOAT. He missed a field goal against the Cowboys two weeks ago that would have given the Skins a bigger lead than six with under five minutes left. He also should have nailed that 23 yard field goal to give the Skins a ten point lead, but he failed. I never liked Suisham, as I think he never made a mind-blowing kick that I can remember. Kickers in the 21st Century need to be like designer womens’ handbags – CLUTCH. Suisham is about as clutch as a wet paper bag. Goodbye you will be missed as much as your pathetic field goal kicking. Maybe Suisham can go and play in Europe for a Swiss team. That way at least he will be amongst his own in the Alps where he can eat Toblerone, wind up his cuckoo clock and play with all the other grass chewing goats.